The Model 670 Cut and Crimp tool feature a slim profile (0.085") that allows access in high density areas and provides excellent sight lines for precise positioning. Swaged leads are firmly attached to the p.c.b, while freshly exposed lead material enhances solderability. Ultra light weight, glare eliminating black finish and ergonomically shaped Xuro-Rubber™ grips ensure operator comfort. 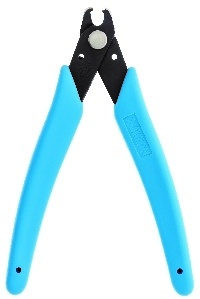 Cuts and crimps soft wire up to 20 AWG (0.8mm). Best results are acheived when the diameter of the hole on the p.c.b. is not larger than 1.5 times the diameter of the wire being cut/crimped.